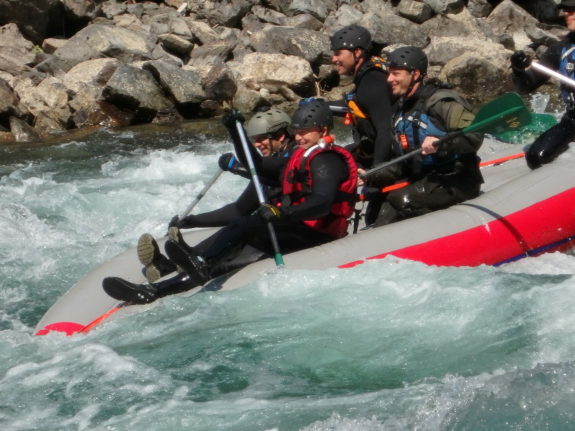 One of the most challenging situations that a group of whitewater rafters face is an upside down raft, with clients, or friends, now in the river. No matter where the raft flip is, it is most likely that at least one of the people in the swift water is terrified in this new environment. Passengers go from being on top of this huge rubber floating object, to now being submerged into a completely unfamiliar environment with the challenge not only of being underwater for a certain amount of time, but also having to deal with the surface water waves, obstacles, and the total disorientation that occurs when being at face level with the river. If the water is cold, we now know that fear or anger, combined with cold water, can create extreme heart stress in the form of Cold Water Shock. This situation should never be taken lightly. It requires a good pre-plan, as well as, the cooperation and assistance of every other raft on the trip to make this as short, and comfortable situation for everyone as possible. My credibility for writing on this river safety topic comes from 40 years of whitewater experience. My first commercial river trip was on the Colorado River through the Grand Canyon in 1976. Since then, my whitewater career has included working as a commercial river guide on the Class 5 section of Cherry Creek in California during the early 90’s as both a paddle guide and oarswoman, Operations Manager for Steve Currey expeditions for many years on the Bio Bio and Futaleufu Rivers in Chile, first descents and expeditions in Russia, Nepal, Central Asia, Indonesia, and U.S. Women’s Rafting Team from 1985-2001. Over the past 15 years I have transitioned into teaching Swiftwater Rescue, and have heard, and compiled information and stories from river guides around the World. My personal experience includes steep, technical Class 5, as well as big water technical Class 5. It is with this background, that I approach this topic of dealing with a flipped raft. This particular article is about the pro’s and con’s of the two approaches open to a river guide who has just flipped their raft. One, being immediately getting on top of the upside down raft, and grabbing folks from the river, and getting them up onto the upside down raft. The other approach, of course, is, as a guide, to get on the upside down raft, re-right the raft, and then pull people into the right side up raft. To answer this question, it is important to assess what is the best option for your passengers in the river. This is something that is always going to have to be assessed, and re-assessed based on a multitude of factors. The factors include: each passenger’s physical fitness and survivability in the river, the nature of the river, what is downstream, how close the other rafts are to be able to help assist in the rescue, where the guide ends up in the river, and how fast they can get onto the raft themselves. A raft flip is a team event; not an individual raft event. When assessing which tactic to use; I think we can all agree that the primary goal is accountability of the raft passengers, and safe exit from the river of not only the passengers; but the guide. The goal is to get everyone out of the river, pull the trip back together, assess the condition of the folks after the flip, and continue downstream with excited and newly baptized people looking forward to what is to come. So; with this said, what does the guide do once on top of the upside down raft? If we can agree on the goal of accountability and quick rescue from the river, there are some definite differences between the two approaches. If the guide gets on top of the raft, he/she can immediately start to count heads, and help the other rafts locate all the people in the river. As she/he is counting, when on the upside down raft, it is possible to start plucking people from the river, and getting them onto the upside down raft. I personally saw a river guide get 4 people out of the water in between waves in a long rapid in the Grand Canyon called Sockdolager. He flipped the raft in the first wave, and by the third wave had all 4 passengers out of the water, and on the upside down raft. On a trip years later, I pulled a near drowned passenger from the water who had to wait until the bottom of the rapid for rescue because the river guide tried through the whole rapid to re-right the raft, only to be thrown off the raft each time. The point being that getting people immediately up onto the upside down raft is most likely the fastest, and most assured way, of getting people out of the river, and getting a head count. Obviously, this is going to be different depending on where the raft flips. If the raft flips in a big hydraulic, it is more likely people will come up farther from the raft, than in a long wave train. If a guide decides to re-right the raft; there are more variables than if everyone is on top of the upside down raft. There is the moment when the guide is on top of the raft, with the potential to get folks out of the water; but instead, the hope is that there will be a better environment for everyone in the right side up raft. It will be easier to paddle to shore, etc. The critical time gap is during the actual re-right of the raft. At this point, many different things can happen. Folks that may be holding onto the raft now must let go as the raft comes over. This is an opportunity for them to be separated from the raft. It is also possible that they will NOT let go; which could make re-righting the raft harder; or potentially impossible. It is also possible that the guide will “miss” the re-right, or get separated from the raft again after re-righting the raft. Once the raft is right side up, the guide must now climb back into the right side up raft before being able to be of further assistance. Any of us who have flipped in big water know how completely exhausting this whole process can be. When we used to raft race on rivers like the Futaleufu and the Zambezi, we would practice re-righting in huge rapids. Even though we were well trained athletes, usually, there was 1 or 2 of us that really struggled. 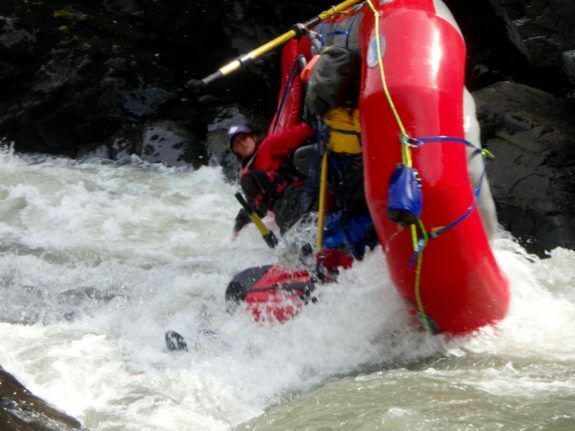 While getting into the raft in an eddy, or under lesser conditions, can be an easy task; when winded, the side of the raft can look like a small mountain to climb, and that one last pull up daunting. In my experience, some of the most devastating stories I have heard occurred during the above process. A good friend of mine resuscitated a drowning victim on the Karnali, in Nepal, after thinking he was going downstream after “paddles”; only to find a person, face down, in an eddy; unaccounted for by the group in the separation after the raft flip. What does this all boil down to? Actually…training! No matter which option you choose, everyone on the trip must be aware of the plan, and there must be a good plan to get everyone out of the river in the fastest, and safest way possible. Passengers in the raft must know the plan, and be trained with the plan. If the river warrants a potential self rescue of a flipped raft, then passengers should be physically trained in the process before it happens; as a minimum, in flat water. All passengers should be trained in what TO DO. They will be an active part of the raft recovery process. In our Swiftwater Rescue courses, we choose to teach folks to get on top of the upside down raft, get folks on top of it, and paddle it to an eddy. We rig VERY tight perimeter lines and a VERY tight bow to stern line on the bottom of the raft. This gives an easy way to climb up on the raft, and a center line for folks to hold onto so as not to fall off the raft during a rapid. We have our folks practice paddling the raft, through rapids, upside down to show the maneuverability of the raft. It is our belief that re-righting a raft immediately after a flip must be practiced and applied to a very specific environment in which it has been determined that is the most beneficial rescue technique. Some of those environments could potentially include: long rapids where the guide is the only one near the raft, big wide open rivers where paddling to an eddy is not an easy possibility, and there is enough recovery time for self rescue by the whole crew; and others that are determined by the guides themselves. The key is to have a plan; and have everyone on the same page with that plan; and to train passengers for their own survival. Our transition in the way we teach this came after two different students left our courses after practicing very FUN re-righting drills in rapids. Whatever you practice is most likely what you will resort to first under distress. One of the guides tried to re-right an oar paddle combination on the Merced River, in cold water, through two different rapids with the passengers clinging to the side. By the time another raft got to the passengers, they were terrified and hypothermic. They would have been totally safe, and happy on the upside down raft; and there was nothing in the river that would have presented as a hazard to them on the upside down raft. The other incident was a high water trip on a class 3 section of river in which the guide tried for a series of rapids to re-right the raft until he became exhausted, and in the water, and he too; had to be rescued. Some of his passengers due to the spacing on the trip were not retrieved until they hit slow water at the reservoir about 5 miles downstream. We choose to train people to get on top of the upside down raft and retrieve passengers. From this baseline, they can go out into the world of whitewater and adapt to new rivers, new environments, and new ways of doing things. 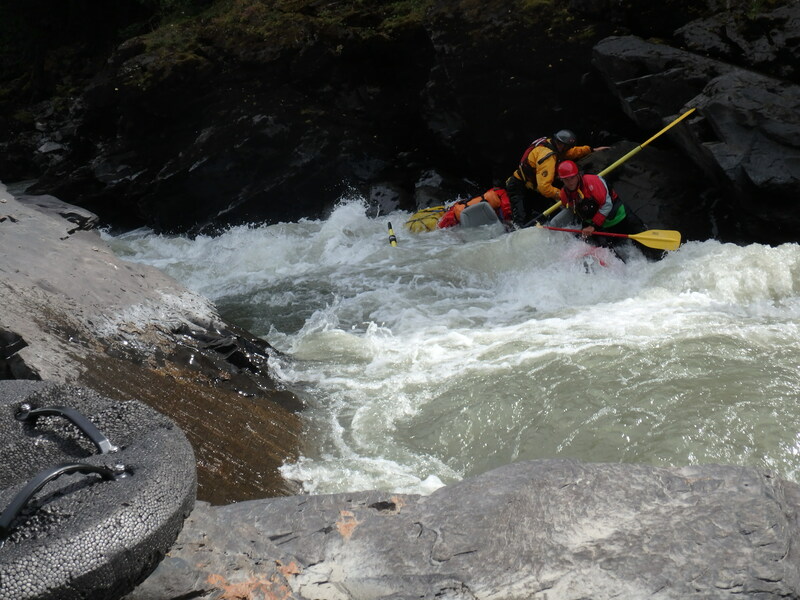 Anyone who plans to re-right a raft mid rapid needs to train hard in that environment, and be physically fit. It must be practiced, and practiced, and getting into the right side up raft should be EASY! Regardless of which technique you decide on; make sure to communicate with each other; and have a plan. The rest of the trip should plan on having to get each person out of the river, and have a good plan for downstream containment. What the guide does on the flipped raft, is just one piece in a complicated puzzle.